Itsy-bitsy bee with pollen all over it. 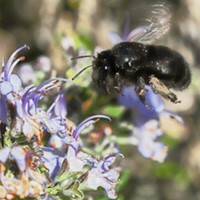 Aside from the digger bees mentioned last week, there are quite a few other native bees out and about. 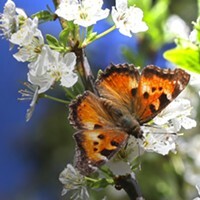 On a casual walkabout in my yard I counted half a dozen different species. 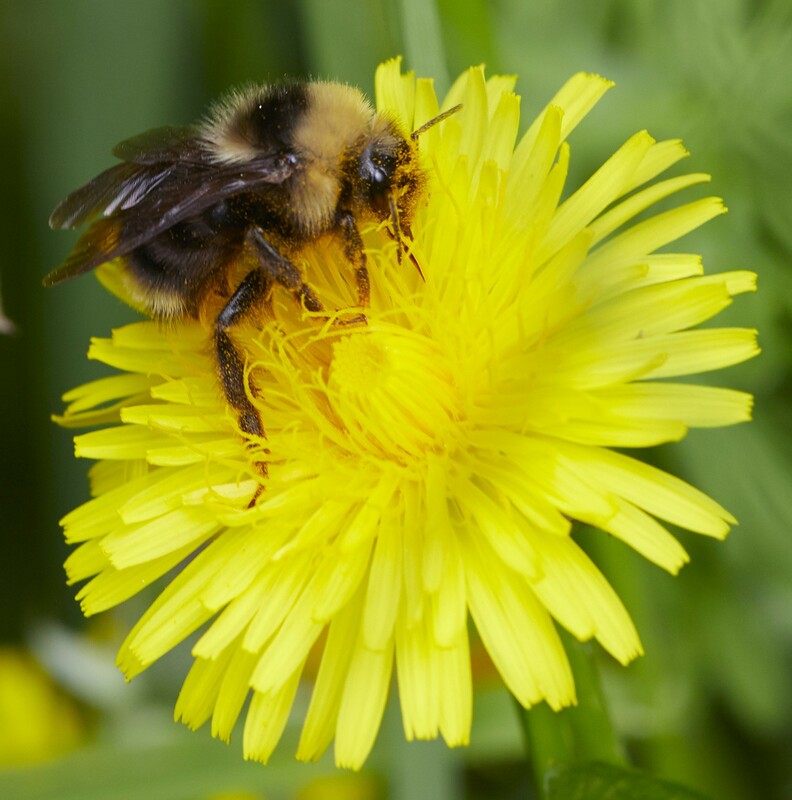 From the yellow-faced bumblebee, the largest bee in my backyard, down to tiny ones, some smaller than the bumble's hind leg, the demands of life and parenthood drive them to seek nectar and pollen wherever and whenever they can. 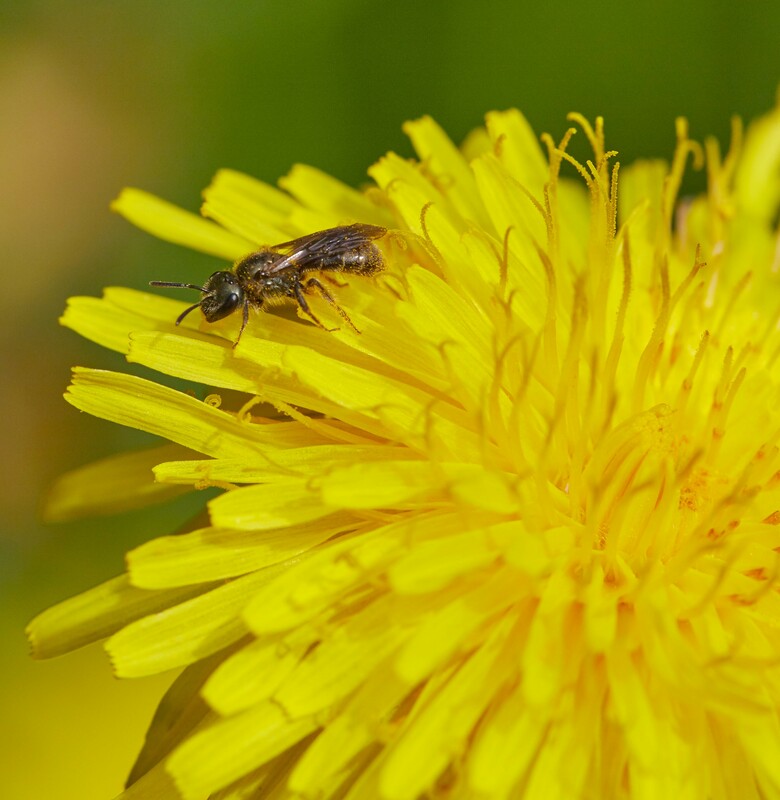 While the sugary nectar supplies the adults with high octane fuel to power flight and nest building, pollen provides protein and other nutrients to build the bodies of the next generation. 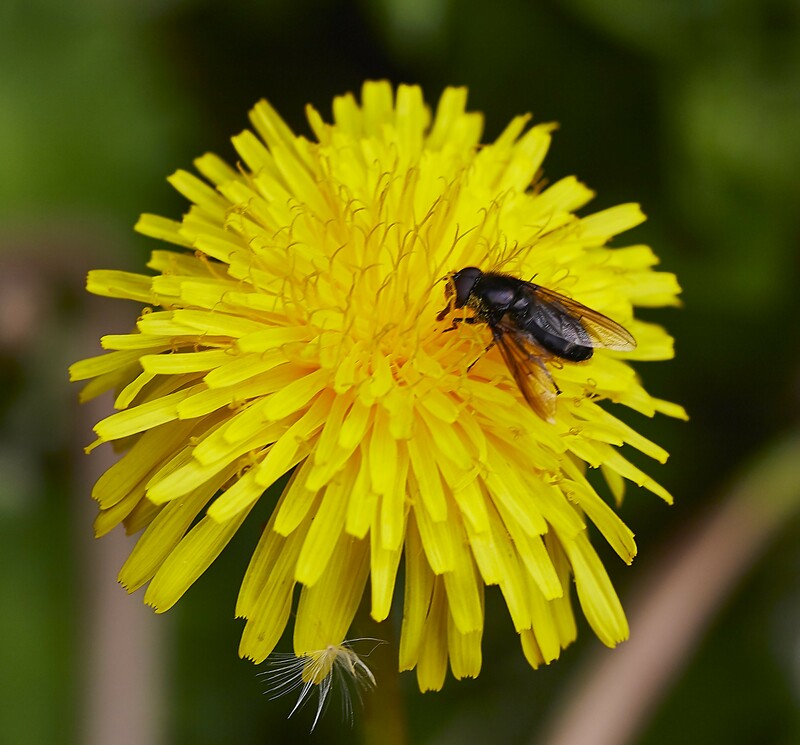 This unidentified shiny black fly also carries pollen between flowers. 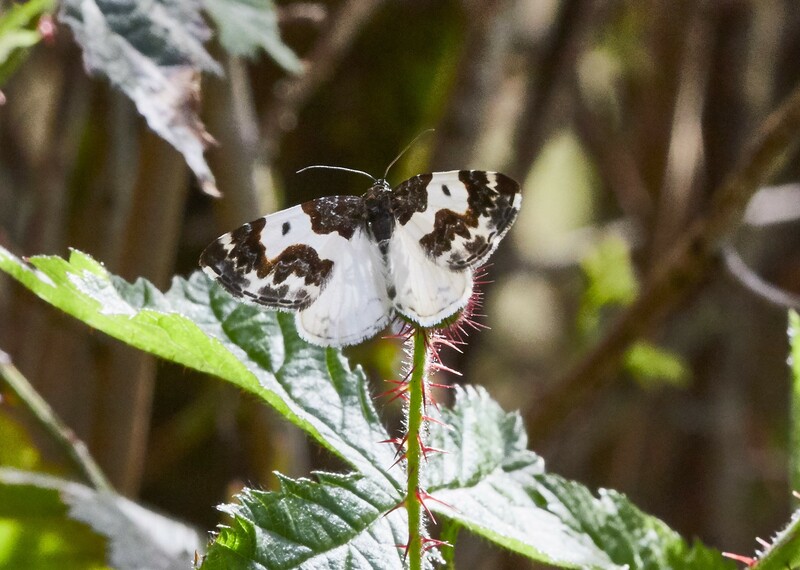 Along with the bees, flies and butterflies, there are even occasional day-flying moths like the Western white banded carpet moth are out these days. Looking a lot like petals from a flowering fruit tree fluttering in the wind, these thumbnail-sized moths usually fly too high for me to get a good photo. This makes it a special occasion when one comes down to my level and lands to pose for a photo. A little research told me the caterpillars of this moth dine on hazelnut foliage. Western white ribboned carpet moth. Another insect that showed itself this week was the green pine chafer (Dichelonyx backii). 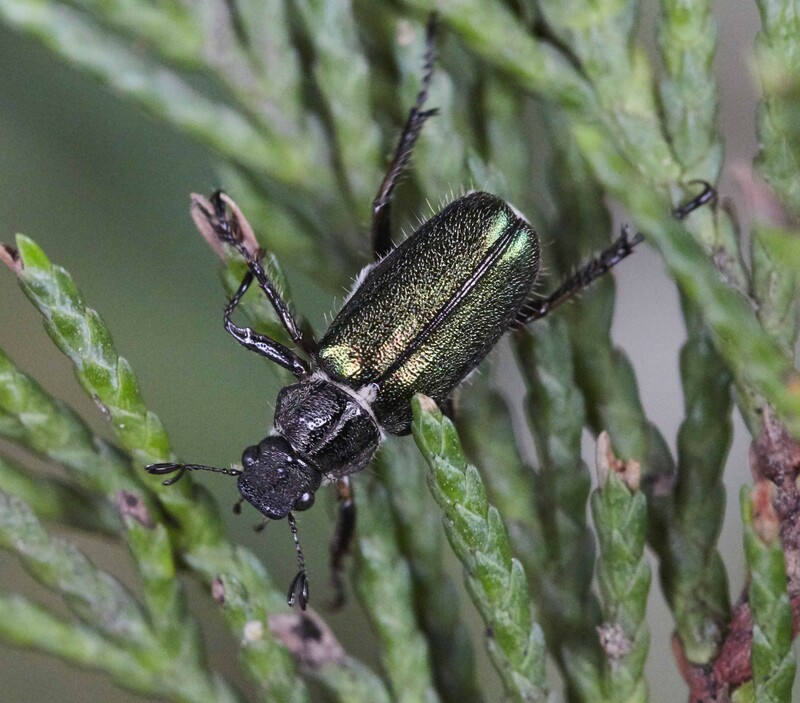 These half-inch metallic green beetles can be seen flying around some of our local conifers. 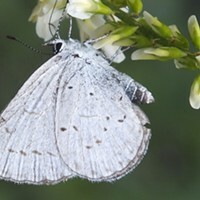 Last year they were on my fir trees, this year I saw about a dozen flitting through the boughs of my neighbor's cypress trees. Green pine chafers are excellent fliers.